Each year, ‘The Economist Intelligence United’ publishes the global livability index of cities all over the world. This year also! The 2018 report shows that not only Australia but Canada as well, both are listed in the top 10 with three cities each. For the first time, Vienna, Austria became first with a score of 99.1/100. Cities have been assessed and rated on over 30 aspects. Hereby you could think of stability, healthcare, culture and milieu, but education and infrastructure as well. This year, many cities have notified improvements in the ranking as a result of increasing stability in most regions. 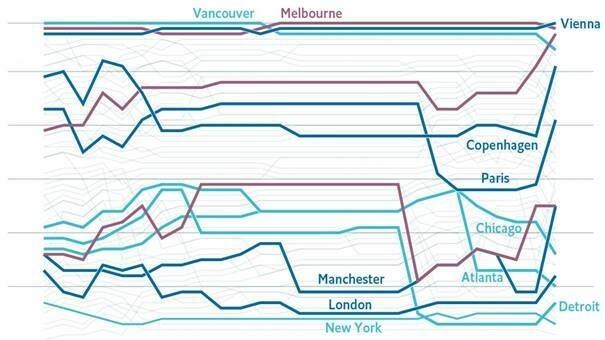 Thereby cities that appear at the top of the list, seems to have a link. The cities that score the highest are mostly medium-sized cities in wealthy countries. Six out of ten cities are located in Australia and Canada, with a respective population density of 3,2 and 4 people per square kilometre.